With the successful sale of the Thousand Sons and Spireguard, I had some funds to spend on a new Heresy project. Initially I had planned to do some more Imperial Fists, but thought it would be a better exercise if I tried a legion I've not dabbled in before. 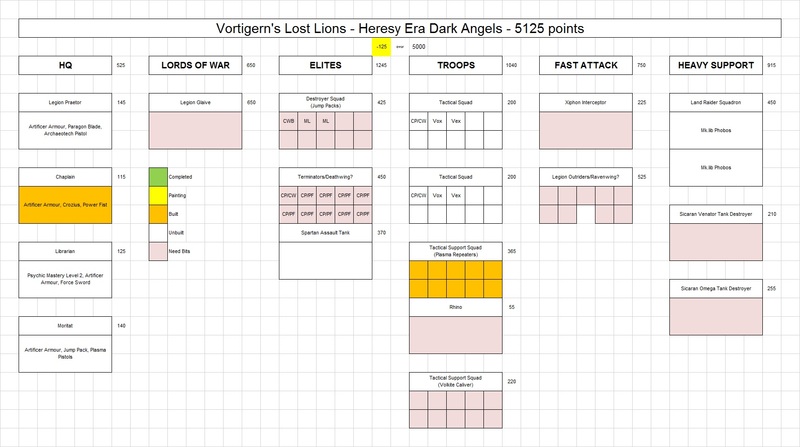 After reading Black Legion, I figured it could be entertaining to build a force around the idea of Vortigern's Lost Lions, a group of the Fallen that survive the heresy and end up joining up with Abbadon following the scouring and the Legion Wars. Figured I'd do a force representing his warhost during the heresy, but generally run them as traitorous Calibanite DA. Not a whole lot done beyond planning and the first few test builds so far, but I have a whole raft of packages arriving over the course of last week and this week! Knowing that the Dark Angels are known for using a lot of old, dangerous and esoteric weaponry, I did figure on doing a couple Tactical Support Squads, one with Volkite Calivers and one with the DA-only Plasma Repeaters. In order to differentiate them from the ordinary plasma guns, I figured I'd use the recent Primaris Hellblaster guns. A little trimming was required but they fit onto the Mk.III plate reasonably smoothly. The addition of some FW shoulderpads and heads and the first squad is coming into focus! I'm leaving the backpacks separate for painting as a change, and am scheming on doing some experimentation with some new painting and weathering techniques on the force - Haven't fully decided on what exactly, but may try out some weathering powders and/or some of the technical paints from GW for mud and slop. 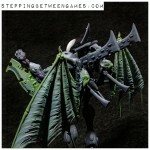 Also scheming on doing some greenish-tinged black with the hope that it won't go full Necron/Tron on me. I rather liked the look of the end result on the youtube tutorial here and am looking forward to giving it a try! ...Well as soon as the weather yo-yo's back up a bit warmer, got a lashing of snow and cold over the last few days. Ah well, more time to build stuff, right? Joel...you are killing it here! This is going to be a really fun force. I love the background. Thanks John! I'm jazzed about it, here's hoping my hands can realize the vision in my head. Hah! Good idea using de primaris weapons to represent the plasma repeaters! Indeed! I particularly like that the heresy Dark Angels are a bit more restrained overall than their "everyone wears a cloak and carries an aspergillum and there's goddamn stonework statuary on everything including fighter aircraft" modern-day counterparts. Hah! Nice use of parts chief. Hoping to see a Cypher in there somewhere in the future? Haha! Possibly? While I do like the newest Cypher model, it doesn't entirely suit the heresy aesthetic. Might have some good bits for use in the project though! Finally a project i can get behind. Circles within circles brothers. Sweet idea, jarring on the eye at the moment ha ha, great idea. Love it mate. I actually had this exact same idea after reading the black legion books. How are you going to represent their iconography? As far as I know from the fluff, they must have the black legion icons, whether or not Abaddon would allow DA iconography I am unsure. Cant wait to see this when its done. Cheers! I'm planning on doing them in their Heresy-era livery well prior to the events of the Legion Wars, but may have to sneak in the occasional sneaky chaos-y iconography here and there. Heh.